MVP voters who omit pitchers from their ballots should be recused from voting, opines Tracy Ringolsby of FOXSports.com. Voting rules stipulate that all players, including pitchers and DHs, be considered for the MVP, so Justin Verlander and Roy Halladay are legitimate candidates, explains Ringolsby. The Tigers' signing of Victor Martinez to a four-year contract is proving to be one of the better moves of the offseason, opines Anthony Castrovince of MLB.com. Nationals righty Chien-Ming Wang has been durable upon returning to the big leagues after missing two-plus years to injury, but he has trouble warming up his surgically repaired right shoulder before starts, according to Adam Kilgore of the Washington Post. Because of this, Wang, a free agent at season's end, has been struggling early in his starts before settling in. Each of the eight likely playoff teams boasts a strong relief tandem, writes Alden Gonzalez of MLB.com. Half of them were formed in the past year: Last offseason, the Diamondbacks traded for David Hernandez and signed J.J. Putz, and the Tigers signed Joaquin Benoit. In July, the Brewers traded for Francisco Rodriguez and the Rangers acquired Mike Adams. Let's check out a few items from the National League West.. While some Rockies fans are clamoring for the Mets' David Wright, Troy E. Renck of The Denver Post says that the club should zero in on Twins outfielder Michael Cuddyer this offseason. While Cuddyer alone won't make Colorado a playoff team next year, he would provide them with a much needed power corner outfield bat. The Giants are 2-8 since acquiring Carlos Beltran, but it's not fair to expect him to turn the offense around by himself, writes Jon Paul Morosi of FOXSports.com. The Padres' expanded scouting department made pulling off the Mike Adams deal rather easy, writes MLB.com's Corey Brock. The club has hired eight new scouts since A.J. Hinch took over as vice president of the department which allowed them to have more than nine different looks at pitchers Robbie Erlin and Joe Wieland. Veteran Alfredo Amezaga, who was shipped from the Rockies to the Marlins yesterday, is delighted to get a new start with his former club, writes Clark Spencer of the Miami Herald. In the latest edition of Full Count from Ken Rosenthal, we learn how this year's trade deadline could have turned out drastically different.. The Rockies wanted five of Boston's top prospects for Ubaldo Jimenez: Will Middlebrooks, Kyle Weiland, Josh Reddick, Felix Doubront, and Ryan Lavarnway. The Red Sox would have gotten more than just Jimenez in return as Rosenthal tweets that the Rockies offered Jimenez and outfielder Seth Smith in return for the quintet of prospects. There were other possible fits in such a deal including Ryan Spilborghs, Chris Iannetta, and Rafael Betancourt. The Rangers had enough prospects to get Carlos Beltran in addition to Koji Uehara and Mike Adams at the deadline. To do that, they would have needed to take either Robbie Erlin and Joe Wieland out of the Adams deal as the Mets are fond of both. Rosenthal was told that one of the two pitchers was in the offer for Beltran. The Indians traded their two best pitching prospects to land ace Ubaldo Jimenez but the deal wasn't just for this season. Cleveland is mindful of the big picture and they have their key pieces locked up for the next few years. Jimenez, Asdrubal Cabrera, and Shin-Soo Choo are under control for the next two seasons while Justin Masterson and Chris Perez are under control for the next three. If the Tribe doesn't win in the next few years, they can always flip some of those players for prospects. The Rangers' bullpen may be a strength instead of a weakness for the final two months of the season. A day after acquiring Koji Uehara from the Orioles, Texas obtained Mike Adams from the Padres. Pitching prospects Robbie Erlin and Joe Wieland go to San Diego in the deal, the Padres announced. Adams, 33, has a microscopic 1.13 ERA with 9.2 K/9, 1.7 BB/9 and a 45.8% ground ball rate in 48 innings this year. The Corpus Christi native is no one-year wonder, either. 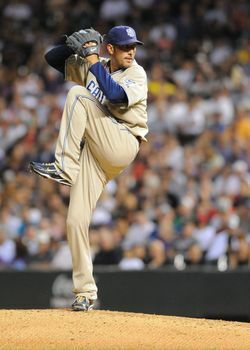 Since joining the Padres in 2008, he has a 1.66 ERA with 10.0 K/9 and 2.4 BB/9. Erlin and Wieland, who are both represented by Sosnick Cobbe Sports, ranked fourth and 22nd in Baseball America's preseason Rangers top 30 prospects list prior to the season. Wieland has seen his stock rise since then, with a 1.23 ERA in 44 Double-A innings – including a no-hitter his last time out. Erlin, a 20-year-old southpaw, is considered among the top 35 prospects in the game by Baseball America and Kevin Goldstein. The Padres' asking price (which I reported two days ago) was high, since Adams is under team control through 2012. He earns $2.54MM this year and since setup men don't make as much as closers in arbitration, he'll be affordable next year. Uehara will also figure into Texas' bullpen in 2012. Evan Grant and Corey Brock reported the deal this afternoon after I reported the Padres' asking price two days ago. Ben Nicholson-Smith contributed to this post. Photo courtesy Icon SMI. The Padres will make two and possibly three trades on Sunday, a source tells Ken Rosenthal of FOX Sports. Reliever Heath Bell, outfielder Ryan Ludwick, and right-hander Chad Qualls are the most likely to move. The source said that the Rangers remain the front-runner for Bell, but the Cardinals are still in the mix with the Phillies and Yankees showing late interest. Two men expected to remain in San Diego are starter Aaron Harang and setup man Mike Adams. The Tigers and Indians were pursuing Harang but both teams acquired better starting pitchers on Saturday. Adams, meanwhile, would takeover for Bell as closer. The Padres have right-handed relievers Heath Bell, Mike Adams, and Chad Qualls on the trading block. Here are yesterday's rumors, and below is the latest. The Rangers continue talking to the Padres about Bell, even after acquiring Koji Uehara, Bob Nightengale of USA Today reports (on Twitter). The Padres have always said they'd be fine with two compensatory draft picks for Bell if the trade offers aren't compelling, Yahoo's Jeff Passan reports (on Twitter). The Cardinals and Rangers remain the most persistent on Bell, tweets Joel Sherman, while the Yankees haven't called the Padres in days about Bell or Adams. The Tigers have talked to the Padres about their group of relievers, tweets Ken Rosenthal, including Qualls. The Rangers, Cardinals, and Blue Jays are the clear leaders for Bell, tweets ESPN's Jim Bowden, with the Angels, Yankees, and Phillies still kicking the tires. Ken Rosenthal has the Rangers as the frontrunner with the Cardinals hanging on. Interest in Adams continues to rise, tweets Rosenthal, but the Padres would still need to be compelled to move him. Meanwhile, trusted Yankees scout Bill Livesey is watching the Padres' relievers, tweets Joel Sherman. The Cardinals are still alive for Bell, tweets Ken Rosenthal of FOX Sports. The Rangers "have gone deep into negotiations with the Padres about Bell, and both sides are optimistic they can strike a deal," reports Yahoo's Jeff Passan. Yesterday, word from Scott Miller of CBS Sports was that Friday's talks between the two clubs did not advance much. MLB.com's T.R. Sullivan feels that logically, the two teams should strike a deal. I've heard the Padres asked for Wieland and Erlin from the Rangers for Adams and were turned down, and were seeking just Wieland for Bell. The Cardinals are still in on Bell, tweets Heyman. The Rangers and Padres continue to discuss Bell, reports Scott Miller of CBS Sports, though they've made little progress. The Cardinals are on the fringe, and the Angels are not involved. The Padres are asking for three players for Bell, and have interest in Rangers prospect Robbie Erlin. Dan Hayes of the North County Times tweets that the Padres are rumored to have interest in Rangers Double-A righty Joe Wieland, who tossed a no-hitter against the San Antonio Missions tonight. MLB.com's Corey Brock questions the upper-level prospects the Cardinals would move in a deal with the Padres, but says Double-A righty Joe Kelly is a name to watch (Twitter link). The Rangers remain the favorite for Bell, tweets Yahoo's Jeff Passan, but they're at a standstill with the Padres in terms of which prospects would be involved. He says the Padres understand they're not getting Jurickson Profar, Martin Perez, or Leonys Martin. The Phillies remain active in talks for Padres relievers, tweets Jon Paul Morosi of FOX Sports. He says they prefer Adams to Bell because of the extra year of control. The Rangers are the frontrunners for Bell and the Cardinals' interest in the closer is growing, according to Bill Center of the San Diego Union-Tribune. It's possible that no team will meet the Padres' asking price for Adams, Center writes. Rival teams still expect the Rangers to acquire Bell, according to ESPN.com’s Jayson Stark. One official even says it’s “a lock.” However, the Rangers continue to shy away from the Padres’ asking price – up to three of their top prospects. The Angels are looking for setup types, according to Ken Rosenthal and Jon Paul Morosi of FOX Sports (on Twitter). The Cardinals are in the mix for Bell and the Rangers remain the favorite to acquire him, according to Ken Rosenthal of FOX Sports (on Twitter). Bell told Scott Miller of CBSSports.com that he would be willing to take a discount to re-sign with the Padres after the season (Twitter link). "I said I'd take a discount, and I want to stay here," said Bell. "Everyone knows that." Jon Heyman of SI.com says (on Twitter) that baseball people around the league expect Bell to wind up with Texas because they have the need and the prospects to get a deal done. Bell told Scott Miller of CBSSports.com that a trade is "going to happen" (Twitter link). Don't expect the Angels to trade for Bell if the Rangers can't swing a deal for him, Mike DiGiovanna of the LA Times writes (on Twitter). The Angels may not have enough upper-level prospects to sway the Padres. The Rangers are "pushing hard" for Bell, according to T.R. Sullivan of MLB.com. The Rangers say any deal for Bell is doubtful today, since the sides aren't close, according to Bob Nightengale of USA Today (on Twitter). Miller reports (on Twitter) that the Padres have not seemed willing to trade Adams. The Padres' asking price on Bell is too high for the Rangers currently, tweets Scott Miller of CBS Sports. The Padres are asking for three players for Bell and the Rangers remain "very interested" despite the Padres' asking price, according to Miller. An executive of one team told ESPN's Jayson Stark the Padres are "getting closer" to a major bullpen deal, and talks "could end quickly." The Rangers appear to be the favorite for Bell, though they've been in on Adams and Chad Qualls as well. The Phillies seem to view Adams as a better fit than Bell, and could try to swing a deal that also includes Ryan Ludwick. Though the Padres are talking actively with the Cardinals and Angels as well, they're higher on the Rangers' and Phillies' prospects. The Padres and Rangers are engaged in substantive talks on Bell, tweets Rosenthal. Similarly, Jon Heyman says the Rangers are making progress on Bell and Scott Miller says Texas has pushed harder today. Miller says they've had "good talks" but nothing is imminent. There's been little substantial dialogue between the Phillies and Padres regarding Bell, tweets MLB.com's Corey Brock. Colby Rasmus was a central part of the Cardinals' discussions with the Padres for Bell, writes Ken Rosenthal of FOX Sports. The Astros are deep into trade talks and could deal Pence as soon as Friday, according to Zachary Levine of the Houston Chronicle, who confirms that the Phillies are the leading candidate to acquire the outfielder. The Astros are "mulling" the Braves' offer for Pence, according to ESPN.com's Jayson Stark (on Twitter). The Braves' offer is "significant" and is built around highly-regarded pitching prospects, but does not include Julio Teheran, according to Stark. The Phillies are making progress toward a deal for Pence, but they'll have to reach an agreement by Friday or the Astros will move on to other suitors, according to Ken Rosenthal and Jon Paul Morosi of FOX Sports. The Phillies would include Jarred Cosart and Jonathan Singleton in a deal for Pence, according to FOX. The Astros prefer younger prospects and Domonic Brown is not currently in the trade. The Braves, who have "more restrictions" on their prospects, would enter the fray along with the Reds and Red Sox if the Phillies don't complete a deal. The Phillies have been Pence's most serious suitor and the Braves have a high level of interest as well, according to Ken Rosenthal and Jon Paul Morosi of FOX Sports. The Angels aren't seriously pursuing Pence and the Astros may be reluctant to trade Pence to the Reds and Pirates, two NL Central rivals. The Phillies and Braves continue pursuing Pence and the Indians are still involved, according to Jon Paul Morosi of FOX Sports (Twitter links). There's a better than 50/50 chance of a deal. The Rangers aren't seriously pursuing Pence, however. The Astros appear to be moving closer to trading Pence, according to Brian McTaggart of MLB.com. Six teams are involved, but no deal is imminent. The Phillies' hope that the Astros will move Pence seems to be holding up the Phils' conversations with the Padres about Ryan Ludwick and Mike Adams, tweets ESPN's Buster Olney. Olney's colleague Jayson Stark adds that interest in Pence is exploding since the Beltran trade, naming the Phillies, Braves, Reds, and Red Sox as suitors. Interest in Pence has picked up considerably with Carlos Beltran off the market, reports Danny Knobler of CBS Sports. As many as eight teams are in on Pence, tweets Ken Rosenthal of FOX Sports, including the Phillies and Braves. Rosenthal says the Astros are listening. The Braves are the last team in on Pence, tweets SI's Jon Heyman. The Phillies "seem to have all but given up" on Pence after their big offer was rejected.